I baked a buttermilk chocolate cake two weeks ago and I have some leftover buttermilk and kept them in the freezer. I usually do not want to keep leftovers for too long, so I will always search on the internet for recipes. 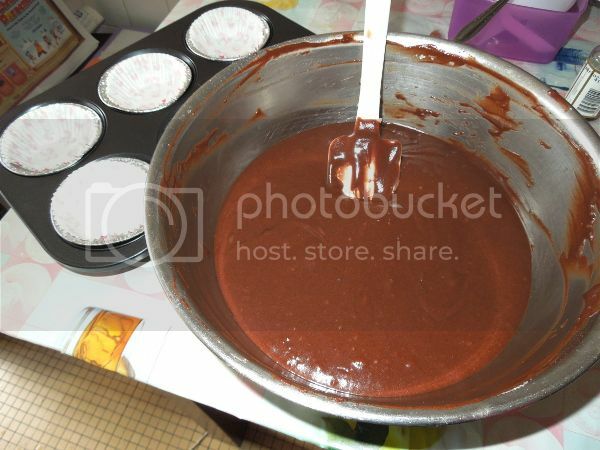 Today, I am making some buttermilk chocolate cupcakes. I love baking cupcakes and muffins because they are just so easy to make. Preparation time is short and you just mix all ingredients together. Its great for parties! I like having cupcakes warm so what I will do is that I will simple pop them in the microwave for a minute or two. The fragrance and taste of the chocolate is richer when its warm. This is also one of the reason I prefer not to use frosting. In a large bowl, cream butter and sugar until light and fluffy. Add eggs, one at a time, beating well after each addition. Beat in vanilla. Combine the flour, cocoa, baking soda and salt. Combine buttermilk and water. Add dry ingredients to creamed mixture alternately with buttermilk and water, beating well after each addition. During the whole mixing process, I just used the whisk and spatula. This is to avoid over beating or else your cupcakes will come out too tough. Fill paper-lined muffin cups two-thirds full. Bake at 375F for 15-20 minutes or until a toothpick inserted near the center comes out clean. Cool for 10 minutes before removing from pans to wire racks to cool completely. MMmmm~~ I just love the scent of freshly baked cakes. They smell heavenly.